teachers for Classes-I to VIII in government or private aided /unaided schools in the State of Odisha. Candidates who qualified D.El.Ed or B.El.Ed or B.Ed or BA B.Ed or B.Sc Bed or B.Com B.Ed or Diploma in Special Education they are eligible for applying online for this OTET Exam 2018. OTET Exam will be conducted in the month of December 2018. 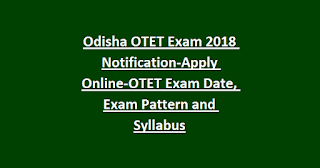 Online application submission dates for this OTET Exam is 12-11-2018 to 27-11-2018. 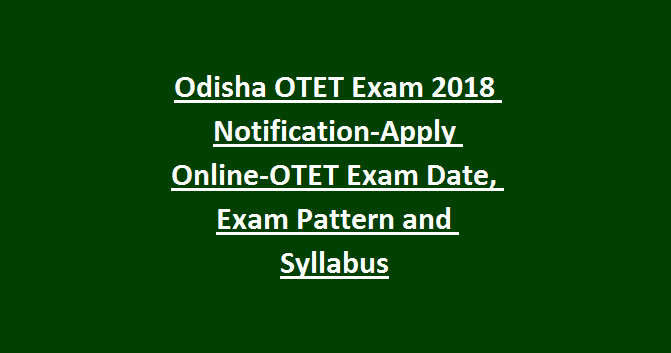 Detailed information about this OTET Exam 2018 Exam Pattern and Syllabus, Qualification and other information is updated below. Higher secondary Education or Degree with B.Ed or B.El.Ed or D.El.Ed or Diploma in Education or Special Education or B.A B.Ed or B.Sc B.Ed or B.Com B.Ed qualified candidates are eligible to apply online for this Odisha Teachers Eligibility Test 2018. Odisha OTET consists of two papers i.e Paper 1 and Paper 2. Each paper exam duration is 150 minutes. For each question one mark is given. Question paper will be given in Odia and English languages. For Language 1 candidates can choose any one of the language of Hindi or Telugu or Urdu or Bengali. For Language 2 English paper is mandatory for all. There are no negative marking for this OTET Exam 2018. Interested candidates who are having above given educational qualification they can apply online for this OTET Exam 2018 before the closing date of 27-11-2018. Apply online for this OTET exam through www.bseodisha.nic.in. Exam Pattern and Syllabus, admit card release date, result and other details are available in Bseodisha.nic.in website.